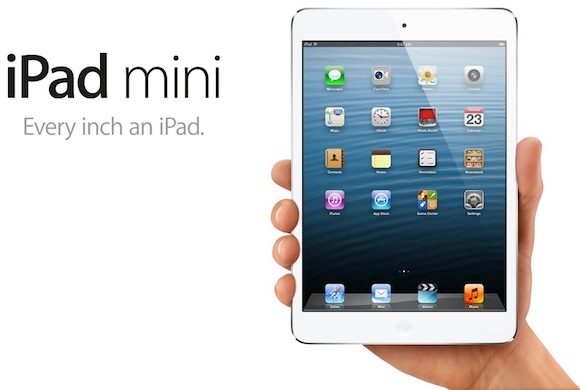 As rumored, Apple announced the new iPad mini at today's media event. The device features a 7.9-inch display with a resolution of 1024x768 pixels, measures just 7.2 millimeters thin and weighs 0.68 pounds. Internally, the iPad Mini has a dual-core A5 processor, a Facetime HD camera on the front and a 5-megapixel camera on the rear, 802.11a/b/g/n Wi-Fi connectivity, and 4G LTE cellular connectivity in some models. Despite its smaller size, the iPad mini still offers up to 10 hours of battery life. With the same resolution as the iPad 2, all existing iPad apps that work on the older iPad 2 will work on the iPad mini without any need for developers to make modifications to their existing apps. The iPad mini starts at $329 for the 16 GB Wi-Fi model, with the 32 GB Wi-Fi model priced at $429 and the 64 GB Wi-Fi model coming in at $529. The models with cellular capability cost an additional $130. All models are available in the same black/slate and white/silver color schemes seen on the iPhone 5. Pre-orders for the iPad mini will start on Friday, October 26 with the Wi-Fi models shipping on November 2 and the cellular models starting to ship two weeks later. Apple has also introduced new polyurethane iPad mini Smart Covers in six different colors, priced at $39 each. Apple also now has a full suite of Lightning adapters to support USB camera connections, SD cards and VGA or HDMI connectivity. No retina display and priced over $300 = no buy for me. This bad marketing decision is the starting point of the downfall of Apple, whether you like it or not. iPhone 5 gets an A6 and this stays with the A5? :confused: I guess we already know something about what we can expect with the next iPad Mini update. Buying a Nexus 7 would be pointless for me. It's not just about the hardware. It is that Apple has created an eco system that is damn near impossible to escape. If you have invested heavily in the Apple eco system this is a no brainer. If you have flexibility then go with the Nexus or whatever else they are doing. "...manufactured to tolerances currently unheard of in our industry".